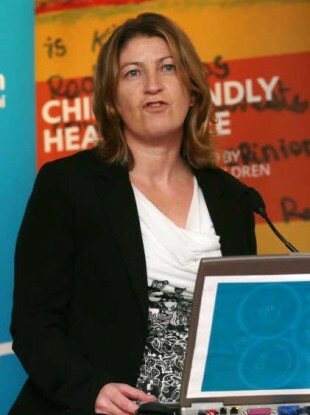 Prof Ursula Kilkelly, chairperson of the Obserstown board of management. THE MANAGEMENT OF Oberstown youth detention centre has tonight called on staff to return to the Workplace Relations Commission after Monday’s work stoppage coincided with a fire breaking out at the facility. Today campus director Pat Bergin brief the board of management at the children detention campus about the fire and violence that broke out at the facility on Monday. The Garda Emergency Response Unit (ERU) was called to the scene to quell the trouble, with a staff member also injured in the disturbance. A Garda investigation is also ongoing. Six units of Dublin Fire Brigade battled a blaze on the roof of Oberstown on Monday night, after a fire broke out around 7.50pm. The disturbance came about after 150 staff picketed for eight hours outside the centre in protest against what they say are health and safety concerns at the facility. The youths were locked in their cells during the protest. Some staff members at the centre volunteered to leave the picket when trouble erupted. A number of residents of the centre took control of a unit earlier in the day after managing to take keys from a staff member. “We are mindful that there is a criminal investigation being undertaken by An Garda Síochána and this must take priority at this time,” said Professor Ursula Kilkelly, chair of the board of management. “On behalf of the Board, I would like to express my solidarity with the staff of Oberstown for what has been an extremely difficult few days. I am grateful to everyone for the exceptional service they have continued to provide during this time. I would like to send our good wishes, in particular, to the staff member injured at Monday’s night’s disturbance and wish him a full and speedy recovery. Prof Kilkelly added that the school on campus has resumed, and that management were determined to ensure international best practice was observed, in the interests of both young people and staff. Professor Kilkelly added that the board is seeking a permanent solution to the industrial relations problem at the campus. We are disappointed that industrial action continues to be on the table notwithstanding that agreement was previously reached between management and IMPACT … over the last three months. Email “Oberstown management calls on staff to defer further strike action following disturbances”. Feedback on “Oberstown management calls on staff to defer further strike action following disturbances”.